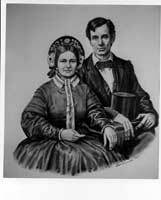 Description: Mr. & Mrs. Lincoln posed together, about as they might have looked had they sat for such a picture in 1855. The two are seated on some type of seat with a furniture arm between them. Lincoln is holding his top hat.